Here comes another exciting game from Yggdrasil. This time with a Viking theme. Maybe not the most original theme out there, but still very exciting. An epic slots journey in the northern part of Europe. Plunder and conquer is the name of the game. So what will we find under the hood? The Yggdrasil game Vikings Go Wild comes with a 5-reel, 25 payline monster and viking themed slot. There are wild and sticky wild in the game, as well as other wild features. A special feature is the treasure chest that will randomly reward players with cash prizes in the game. And of course there are free spins to be won in the game as well. Where can I play Vikings Go Wild? If your up to the task you can play Vikings Go Wild for free on several of the online casinos that provides Yggrasil Gaming software. This include, but not limited to, LeoVegas, Videoslots, Vera and John and more. 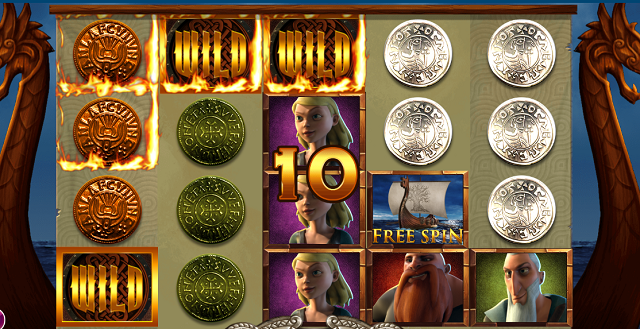 Where is free spins available on Vikings Go Wild? At the moment there aren’t any current promotion targeted exclusively for Viking Go Wild fans. The free spins upon registration offers are more then often on games like Starburst or Gonzo’s Quest. But if there is one, check out freespinsslots.com front page and you will have a full list what’s available right now on various casino rooms. Does Viking have any unique features than other slots? Well yes. There is two ways a player can activate a bonus game on Vikings Go wild. Either with a hidden treasure, but also with the symbols for free spins. If a player get three free spins symbol or more, then a bonus game will be activated. The bonus game will feature sea monster that the Vikings in the game will have to fight of. Every Vikings that remains in the same position until the game ends, will be a wild symbol. You might be able to guess that you can’t as many Vikings as possible to optimize winnings.